Happy Sunday! Another gorgeous day in America. The Sun is shining, the birds are singing, and consumer confidence is up. This pinup is by Walt Otto, with a wee bit of help. American Power has Aly Raisman. And plenty of other stuff. Doug Ross has Larwyn’s Linx: (Sunday placeholder). And Saturday’s Larwyn’s Linx: Why Trump went for a 21-day suspension of the partial shutdown. A View From The Beach features Rule 5 Saturday. And tattoo science. And another reason Trump was elected. Don Surber: Trump wins because he isn’t screwing anyone over. The Feral Irishman has a fabric test. Knuckledraggin My Life Away has something to leave you with. And has a big GIF dump. And has more fun all week long. Evil Blogger Lady has Rule 5 ladies of Man In The High Castle. And some Rule 5 linkage. And more during the week. Bookworm Room: The assault smirk and scary leftist illustrated edition. Irons In The Fire (new to the list) has some babeage, and does it all week. Victory Girls Blog: Ilhan Omar: Evil in the House. 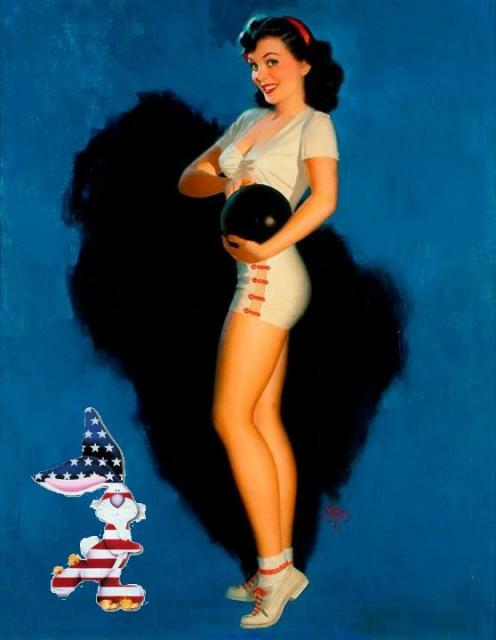 This entry was written by William Teach and posted on at 9:38 am and filed under Patriotic Pinup. Bookmark the permalink. Follow any comments here with the RSS feed for this post. I hope your preparing. Seriously. I do not hold out any hope whatsoever for this nation as the political divide is so intense it is according to scholars in the know even more powerfully divisive than it was during the beginning of the civil war. And If you are not prepared for the coming ice-age you certainly will not be prepared for the civil war that is about to erupt in the United States. Why the hell do you think the left wants our guns? Thanks again for the linky thing..